Owned by M. Tabor and trained in France by JE Hammond winning eleven races from 8f to 12f between 2yo to 4yo. Won both races at 2yo and five from seven at 3yo including the French and Irish Derbys and the Prix de L'Arc. Ran at 4yo winning four from six with the King George as the highlight, finished the season with a fourth in the Prix de L'Arc and second in the 10f Champion Stakes. 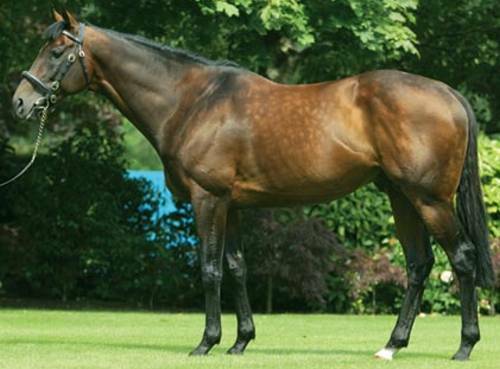 Second season sire in 2005 and a remarkable start with his first crop of 3yos including Irish Derby and Prix de L'Arc winner Hurricane Run, Derby winner Motivator and St. Leger winner Scorpion. Mixed record with his two crops of British raced 2yos with a well above average record in his first season in 2004. This set were led by 8f Group 1 winner Motivator and 10f Listed Ayam Zaman. Wins were mostly between 7f to 10f from July onwards although included one 5f win by Kings Quay (trained, unsurprisingly, by R. Hannon). The 2005 group had just three maiden race winners over 7f. 67 yearlings sold in 2005 for an average well over 100,000gns. 6 winners from 19 runners in 2006 mostly over 8f and from mid-August onwards. Highlight came in late season when the once raced, but promising, maiden Authorised won the Group 1 8f Racing Post Trophy. 58 yearlings sold for an average over 103,000 guineas. Died in late March 2012 aged 16.